The FreeWay educators are scheduled on a "first-come, first-served" basis due to limited availability. Our prevention specialists are screened and trained to present the FreeWay and PeaceMaker curriculum in public and private school classrooms,grades k-12. Prevention Specialists conduct presentations free of charge to those Missouri school districts that have registered for the current school year. One set of curriculum is also provided free of charge to those schools that have registered to receive presentations. Each grade level contains four units (1 lesson plan per unit), with four classroom sessions per unit. Prevention Specialists will teach the lesson plan for each unit in each assigned classroom. Lessons are presented in individual classrooms and a teacher or staff member must be present. 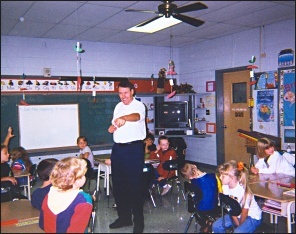 The classroom teacher is encouraged to teach the remaining sessions (activities) between prevention specialist visits. May be scheduled for a minimum of three (3) classroom sessions up to a maximum of six (6) classroom sessions per day. Out of state school district will be responsible for the Prevention Specialist's round-trip travel expenses from St. Louis, including mileage (or airfare), meals, and overnight accommodations, if necessary.